Vintage Halloween Decorations – A HOT Collectible! You are here: Home / Articles / Vintage Halloween Decorations – A HOT Collectible! Halloween is around the corner and I know many of you are interested in starting vintage Halloween collection but are not sure where to start. 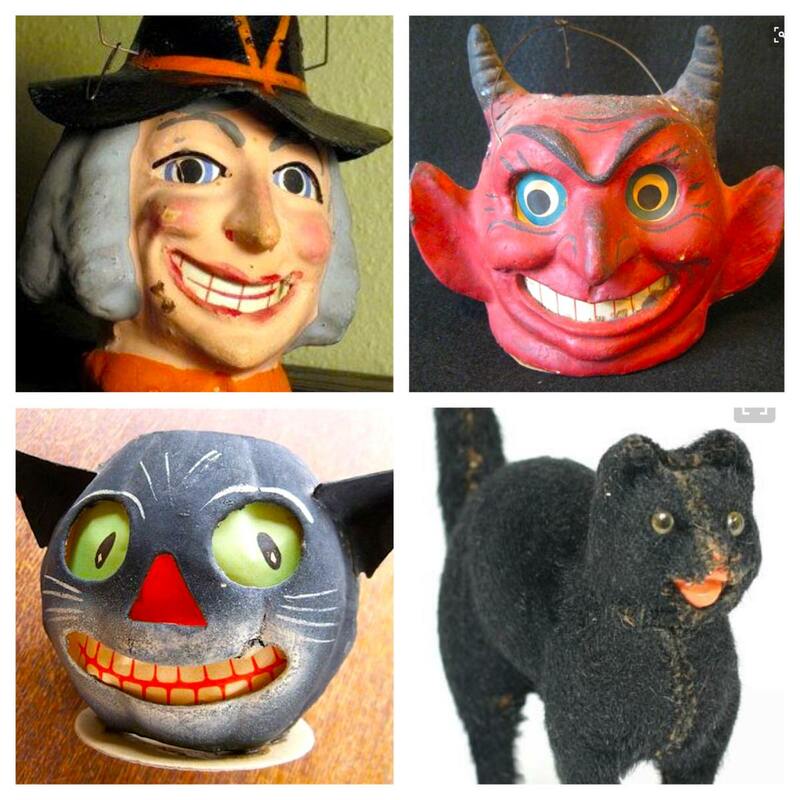 Collecting vintage Halloween masks, celluloid toys, noise makers, containers or lanterns are just some of the spooky fun collectibles you can start your collection with. Below are some tips that I hope are helpful to you as you start your quest to collect vintage Halloween. 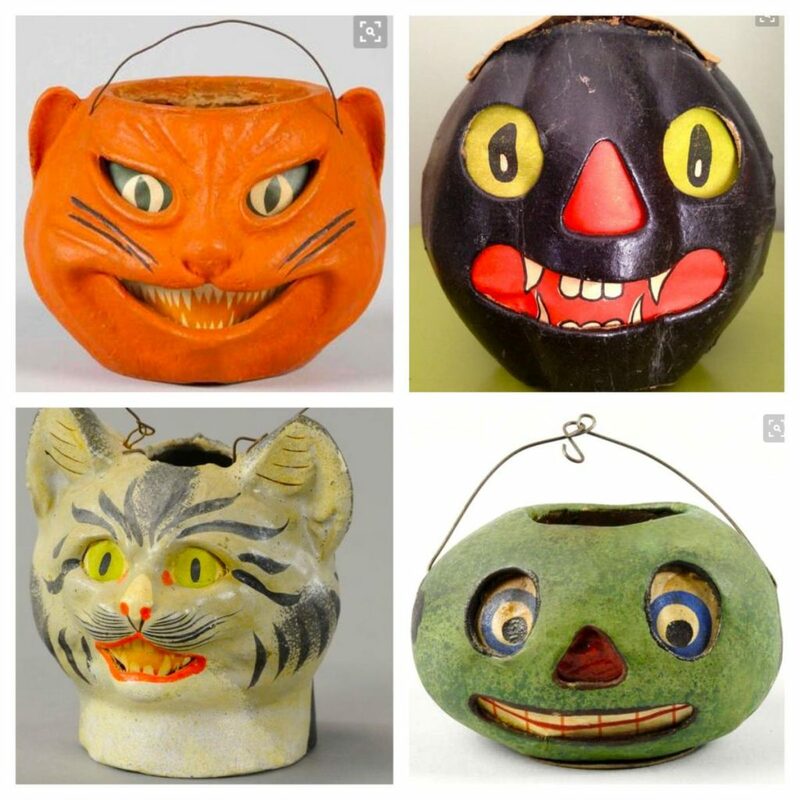 Vintage Halloween papier-mâché lanterns, noisemakers, and candy containers were originally used for adult-oriented parties from 1915 until about 1950. Unlike Christmas collectibles, which were carefully packed up and handed down through generations, Halloween items were not meant to keep, so finding undamaged pieces today is difficult. You probably won’t find Halloween collectibles at random garage sales or flea markets unless you’re lucky. Instead, try big shows like Atlantique City, Brimfield, and Round Top, The Portland Antique and Collectible show, Ebay, Etsy, antique and collectible shops and vintage toy shows. Most lanterns are $300 to $500 because of their scarcity, but some are worth thousands. Watch out for missing eyes and burned handles. Expect to pay $15–$100 for noisemakers (clickers, rattlers, and tambourines). Candy containers are usually a bit more expensive—$100 or more. All prices depend on condition and rarity. Do your research too. There are many books and websites where you can learn so much about vintage Halloween collectibles as well has to store and preserve them so they continue to last for many more years.